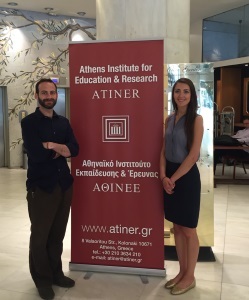 Dr. Sakkal and his advisee Jillian Correia presented their research projects at the 9th International Conference on Sociology at the Athens Institute for Education and Research (ATINER) Conference in Athens, Greece this past week. ATINER is an independent world association of academics and researchers and is a truly international conference, with presenters coming from over 70 countries this year. Dr. Sakkal presented his study, titled, “‘Learning Life’: Contemplating Student Perceptions of Learning while Traveling” as part of the Education division of the conference. Jillian presented the duo’s co-researched study, “Culture in the Cafeteria: How Children Approach Eating within the Context of School Lunch” as part of the Culture-Community-Minorities division. This was a great chance for both a faculty member as well as a student to present their own as well their co-researched work to a variety of researchers from numerous disciplines and countries. It was also a great way to represent the great research and faculty-student relationships that occur here at Wake Forest University.